2 days into my trip to the US, and we’ve seen 2 Broadway shows. The prices over here no longer seem as ridiculous as they did a few years’ back – I guess that’s a combination of a great exchange rate and massive inflation on ticket prices in London. But anyway, I’m on holiday, so who’s counting! Last night saw the Tony Awards ceremony, and I was hoping to see some success for the Broadway production of Sunday In the Park with George, originally produced at the Menier Chocolate Factory. 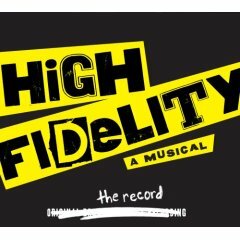 Unfortunately, it didn’t pick up any of the 9 awards that it was nominated for – instead, it was left to South Pacific, In The Heights and Gypsy to share the spoils..
‘High Fidelity’ – why did it fail so spectacularly? I have been listening to the High Fidelity soundtrack a fair bit on my iPod recently – in case you’re confused, I’m talking about the soundtrack from the Broadway musical, and not the film. Since it hasn’t been on in London, very few people even seem aware of the show’s existence, so I thought I would write about it and try to introduce some more people to a show with music that I like.